Could this comparatively affordable passive EQ with valve make-up gain actually be better than the revered Pultec unit that inspired it? Wes Audio are relative newcomers to the pro-audio market, joining a small throng of interesting 'boutique' manufacturers from Poland, alongside Bettermaker, Looptrotter, IGS Audio and others. The company's first hardware product was a tribute to the well-known Urei 1176 FET compressor, in the form of an enhanced version called the ß76 (or Beta 76, reviewed in SOS January 2013). Radoslaw Wesolowski, the man behind Wes Audio, spent over a year developing the second offering, which is a reworking of a Pultec-style equaliser. This single-channel LC EQP combines passive inductor, capacitor and resistor-based EQ circuitry with a twin-valve make-up gain stage and also incorporates several new features and enhancements over the Pultec EQP 1A that clearly inspired it. This mono equaliser is housed in a 2U rackmounting case (instead of the 3U case of an original Pultec), with a 1.5mm stainless-steel chassis and 4mm-thick black-anodised aluminium front panel. The chassis extends about 230mm behind the rack ears and the unit weighs 7kg, thanks in part to its Carnhill input and output transformers. The lid is held on by six Torx screws, so to replace the valves you'll need to have the right Torx screwdriver or bit. The unit has a three-year warranty, which is reassuring, and I gather that the company is very responsive to its customers. Easy-to-read white front-panel legends detail each control's settings, and the controls are arranged in a layout that broadly follows that of the classic Pultec design. The same format of large gain-adjusting potentiometers (scaled from 0 -10 with half-position markers) and smaller frequency-setting switches is retained too. Paddle-style toggle switches at each end of the panel implement a true relay hard-bypass function, and turn the unit on/off. Indicator LEDs are associated with both switches. 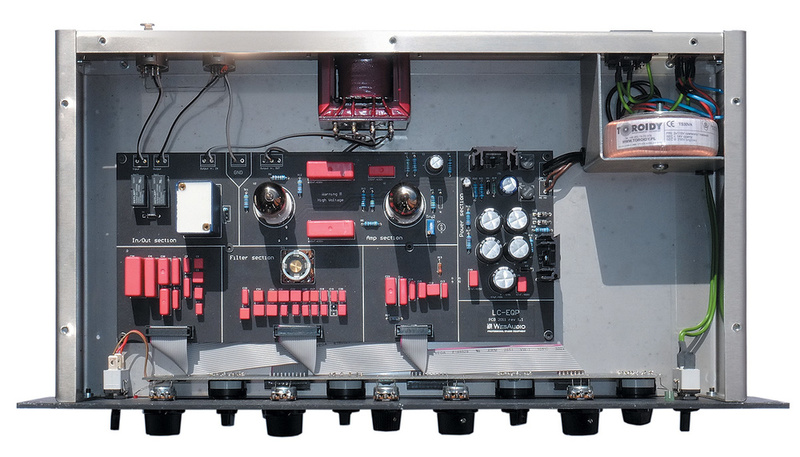 The rear panel carries a pair of Neutrik XLRs for the transformer-balanced, line-level input and output, while an IEC inlet with integral fuse holder accepts mains power. The internal linear power supply can be switched between 115 and 230 V AC supplies via a rear-panel switch. Internal construction is very simple, but nicely done. The mains inlet, voltage selector and torroidal transformer are contained behind a metal screen, with the mains safety earth being taken directly to the case. The only minor negative observation I'd make here is the use of green-coloured wiring connecting the live supply between the IEC socket, front-panel mains on/off switch and transformer. It's not unsafe, just unusual and will cause any servicing technicians to look twice! The EQ itself is a passive design, and the make-up gain that this makes necessary is provided by two dual-triode vacuum tubes, one an ECC82/12AU7, the other an ECC83/12AX7. A single, large circuit board dominates the internal floor space, with clearly divided zones for the regulated power supply, amplifier stage, filters and output electronics. Wima MKP4 metalised polypropylene capacitors are used throughout, and in the filter sections the capacitor banks are arranged in elegant groups according to their height and size! A single multi-tap open-frame inductor is employed in the HF boost filter section, and relays provide the hard-bypass function. A Carnhill input transformer is mounted on the circuit board, while a much larger output transformer is fixed to the rear panel — both will be familiar to Neve aficionados. Passive equalisers can only attenuate the signal, of course, and so some form of amplifier is required to provide the boost functionality on offer here. To that end the LC EQP is equipped with a gain stage built around two dual-triode valves: an ECC82 (12AU7) from JJ Electronic, and a 12AX7 (ECC83) from Electro-Harmonix. Both the anode HT and heater power rails for the valves are fully regulated to ensure consistent performance, and apparently there is no negative feedback employed around the amplifiers in an effort to minimise transient distortion. All of the operational controls are wired to a daughter PCB mounted behind the front panel, and that is connected to the main board via three ribbon cables. The technical performance is good for a valve device, with a maximum output level of +22dBu at a total harmonic distortion (THD) figure of around 0.8 percent, a signal-to-noise ratio of 90dB (ref +4dBu), and a frequency response extending between 5Hz and 65kHz (-3dB points). All of the front-panel controls are logically divided into four separate and completely independent sections, each with its own pair of gain and frequency selector controls. On the left are the low-boost and low-cut sections, with high boost and high cut to the right. A bandwidth control in the centre of the panel is associated with the high-boost section. The LF boost and cut sections both have gentle shelving responses and, as with the Pultec design, combining the LF boost and cut equalisers simultaneously produces the famous 'dip before lift' EQ shape which is such an important element in the characteristic Pultec sound. The gain controls both provide up to 18dB of boost or cut, as appropriate, and the equaliser turnover frequency options are generously expanded in comparison with the original Pultec. Not only are there separate frequency controls for the bass boost and bass cut sections, but two additional options have also been added (120 and 250 Hz) to supplement the standard 20, 30, 60 and 100 Hz turnovers. The high-cut section again offers 18dB of attenuation for its shelving response, and some additional turnover options, comprising 2, 4, 6, 12, 16, and 20 kHz. As in the original Pultec, the HF boost section provides a peaking or bell-shaped response, with adjustable bandwidth. Slightly more gain is provided here, with up to 20dB on offer, and the counter-clockwise (0) end of the bandwidth control provides the narrowest bandwidth option, while the clockwise end (10) provides the broadest — although the bandwidth actually varies with frequency, getting narrower with higher centre frequency values. Supplementing the original Pultec's 3, 4, 5, 8, 10, 12 and 16 kHz positions, this Wes Audio design extends the range at both ends and in the middle, with new 1, 1.5, 2, 6, and 20 kHz positions. Using the LC EQP is very straightforward — easier and far more logical than the classic Pultec EQP 1A, in fact. Everything works exactly as it should, and the expanded turnover frequency settings make it very easy to achieve the desired effect in a very short time. Like the Pultec, this is most definitely a 'programme equaliser' ­— a device for gentle and subtle sweetening and enhancement of a sound source — rather than being a surgically corrective tool. It achieves that tonal shaping in a very musically sympathetic way. Although the ability to combine both LF cut and boost simultaneously might sound odd, it actually works remarkably well, just as it does in the Pultec, because the shapes of the curves are different and the way they interact produces a complementary EQ 'change of direction'. So if you want to boost the LF, the cut control (set to the same frequency) introduces a dip at the start of the shelf which helps to minimise the mid-range muddiness that might otherwise result. The outcome is low-end weight with mid-range clarity, which is usually exactly what is required, and not something that can be achieved with a simple LF shelf equaliser alone. One big advantage over the original Pultec design is that the LC EQP affords the option to set the boost and cut sections to different frequencies, giving far greater flexibility and the ability to tune the dip more effectively. It works really well on bass guitars, upright bass, kick drums and pianos, helping to add weight and solidity without losing definition, and in general none of the gain controls ever need to be raised higher than 4 or 5 on the scale. Subtlety is the name of the game here. The high-boost control is useful for adding air or presence, and the adjustable bandwidth helps to focus in on the specific area that needs treatment. The additional high-mid centre-frequency options cater for situations where you want to push the mid-range energy a little harder, but for me the real strength of this EQ section lies at the high end, where it adds sparkle and air in a deliciously subtle way. Again, working in concert with the high-cut section allows useful tonal sculpting with great flexibility. As always, being able to compare the EQ changes against the source is vital to check whether you have really improved matters or just made it louder and brighter — something which is so easily done! — and the hard-bypass function is very handy in that respect. However, there is currently no option to trim the EQ output to allow properly matched levels, which is a minor frustration. I know that few equalisers include this function, but it would be very useful, it would further enhance the Pultec concept, and there is certainly space to add the extra control — perhaps that's something to consider for a future update. A stereo unit with carefully matched gain controls would also be a worthy sibling, ideally suited for mix-bus shaping and mastering applications. The LC EQP is a very nice product with a well-executed enhancement of the Pultec passive EQ concept, an elegant minimal-feedback valve amplifier, transformer-balanced I/O, and a very good build quality. It also sounds fabulous and is remarkably easy to use, and in all of those respects I'd tentatively suggest it offers valid improvements over the original Pultec EQP 1A and easily justifies the asking price. There are countless Pultec equivalents on the market, such as the Cartec EQP 1A, Manley Enhanced Pultec EQ1PA Single, Mercury EQP1, Pulse Techniques EQM 1A3 or 1S3, and Tubetech PE1C studio equalisers, but all are more expensive than the Wes Audio LC EQP. For stereo bus or mastering applications the Retro Instruments 2A3 Program EQ and Manley Enhanced Pultec EQP 1A Dual are strong contenders. The nearest competitor in terms of price is probably the Pultec clone offered by Polish compatriots IGS Audio. Very nicely enhanced Pultec-style progamme equaliser. Superb sound from its Carnhill transformers and dual-triode valves. Good technical specifications and build quality. None really, but if pressed I'd offer the lack of a gain trim control. This very nicely enhanced Pultec-style programme equaliser offers separate frequency controls for every section and useful turnover frequency additions. Great build quality, Carnhill transformers, twin dual-triode valve gain stage with minimal feedback, good technical performance, and a lower cost than the nearest equivalent mean there's not really anything not to like!